Today I did not play very well. It started right at the beginning of the game because I hadn´t expected 1…e5 and was out-of-book after a few moves. Nevertheless, I felt quite comfortable in the middle game. I was one pawn up but my king was weakened. That´s why I had to play very cautious. Instead I blundered and found myself in a totally hopeless position. Luckily, my opponent – GM Gennadij Fish – had only a few seconds left and forced a draw by sacrificing a rook. Lucky me! At least, I didn´t play as long as in the first round and I even got something to eat after the game :-). The barkeeper had been irritated about my seven-hour game yesterday, so today we only got a small buffet and couldn´t order anything from the menu. I hope he will be in a better mood tomorrow. During the rounds we always get some sandwiches and fruits. I am enthusiastic about the fact that those sandwiches consist of whole-grain bread because normally it´s only white bread. Yesterday, we even got some salmon… something I badly miss at the breakfast table. 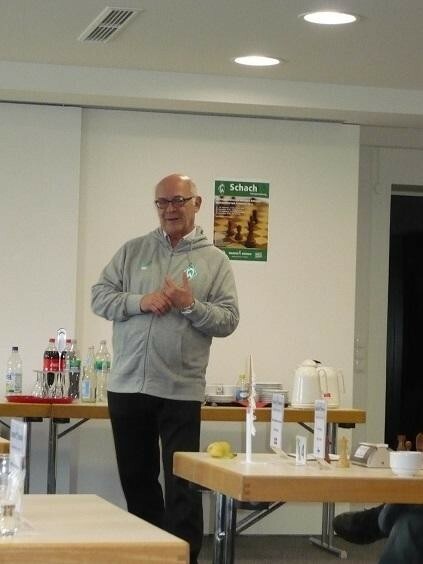 The second round started with a little speech by Klaus-Dieter Fischer, president of Werder Bremen. His emergence indicated that chess is highly valuated in this club, which is also well-known for its football team. Talking about football: tomorrow we are going to meet Marco Bode and Zlatko Junuzovic… I am really excited about this!